MediaMath is a demand-side media buying and data management platform. This means that brands and ad agencies can use our software to programmatically buy advertisements as well as manage and use the data that they have collected from their users. We serve over a billion ads each day, and track over 4 billion events that occur on the sites of our customers on a busy day. This wealth of data makes it easy to imagine novel reports in response to nearly any situation. Turning these ideas into scalable products consumable by our clients is challenging however. The typical lifecycle of a new report. Popular reports are first built into a custom web-app for clients. Extremely popular ones are built into the UI of our core product. Proof of concept is easy. All it takes is a novel client request or a bright idea combined with a scrappy analyst, and you’ve got a great idea for a new product. Building a proof of concept into a custom web app is harder, but should be achievable by a savvy team with a few days to dedicate to the project. Including the report in the core product is often prohibitively hard, as it requires coordination between potentially many teams with potentially competing priorities. This blog will focus on the second stage of this process: Turning a concept report into a scalable web app for client consumption, a process that Databricks has significantly streamlined for us. 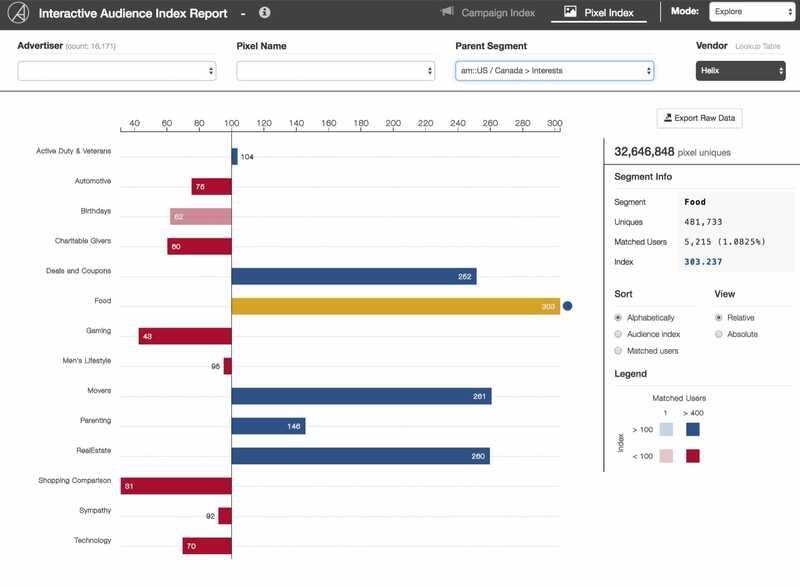 The Audience Index Report: What is it? Knowing the index of a site-segment is useful because it allows MediaMath clients to quantify the demographic and behavioral features of the users browsing their web content. It also is beneficial to our partners, because our clients can take insights gleaned from the report and then target an appropriate audience population (also known as a segment) by buying data from our partners. Producing the AIR – Why Databricks? I chose to implement this workflow with Apache Spark in the end, despite how primarily ETL heavy it was. I chose Spark for a couple of reasons, but it was primarily because much of the processing required was awkward to express with SQL. Spark’s RDD APIs for Python provided the low-level customization I needed for the core ETL work. Additionally RDDs are readily transformed into DataFrames, so once I was done with the messy transformations I could slap a schema on my RDDs and use the very convenient DataFrame APIs to further aggregate them or write the results to S3 or a database. The Databricks platform was also convenient because it brought all of the overhead required to run this workflow into one place. The Databricks UI is focused on notebooks, which suits this workflow well. I was able to create a couple of classes that handled all of the ETL, logic, logging and extra monitoring that I needed. I imported these classes into a handler notebook and used the Databricks job scheduler to configure the details of the cluster that this workflow runs on and to run the job itself. Now I’ve got my entire workflow running from just one Python notebook in Databricks! This convenience sped up the development process tremendously compared to previous projects and was just a lot more fun. 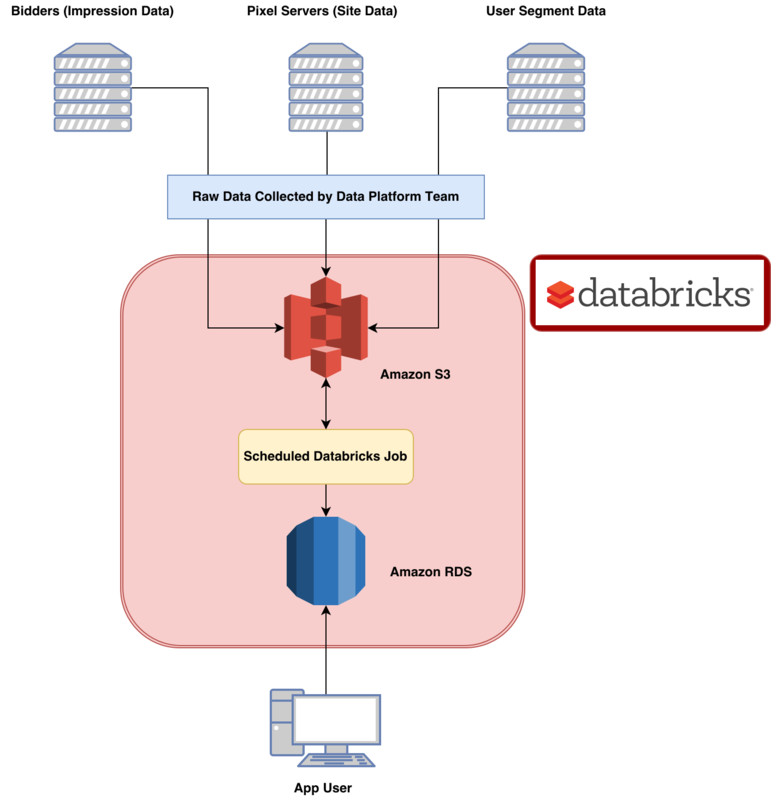 Databricks greatly reduces the overhead required for building an effective, back end workflow for our reports. Now many data engineering tasks are trivial and more energy can be focused on producing content, rather than maintaining overhead. UserID Nested Dictionary with segmentID and max and min timestamps corresponding to the time when the user was added to the segment. We are well prepared now for Step 2: Joining and aggregating the data. Notice how there are only seven lines here rather than nine. This is because we enforce the condition that a user must be in a segment before the first time they visit a site in order to be included in this report. Two records are scrubbed out here for that reason. Now I can convert this dataset into a DataFrame and aggregate it appropriately ( count() grouping by site and segment). Since the result is itself a DataFrame, we are well set up for step 3 – writing to the relational database. This is the workflow for |𝑝 ∩ 𝑠|. The workflow for |𝑝 ∩ 𝐺𝑠| is similar, and I’ll omit it. Now we’ve got everything in an Amazon RDS where careful database design allows our app to serve data quickly. We’ve managed to take hundreds of terabytes of data (this report aggregates the last 30 days) and condense it into a consumable report widely used by clients at MediaMath. Databricks provides a convenient platform to abstract away the painful parts of the orchestration and monitoring of this process. With Databricks we were able to focus on the features of the report rather than overhead, and have fun while we were doing it. An example of the finished report. Segments that are over-indexing are shown in blue, while those that are under-indexing are shown in red. The advertiser and pixel names have been removed. Props to Sr Data Visualization Engineer Nicola Ricci for creating such an attractive visualization.